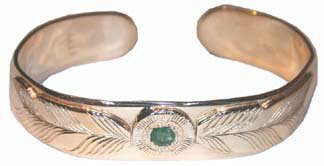 Bracelets, Custom made in silver, gold , platinum and gem stones by Bearclaw Native American Indian Jewelry. 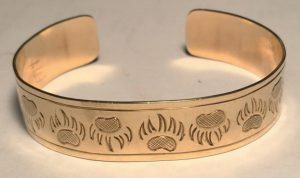 Cast , appliqued and Engraving ,gems and custom Chipewyan silver and gold jewelry with Native and Nature themes our specialty. One-of-a-kind Unique quality. 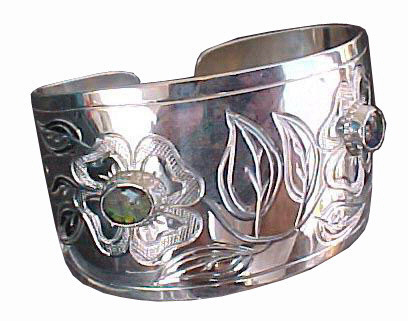 These are mostly Cuff style bracelets but many styles are available, thinner multi-piece or gemstone bracelets like the ‘tennis’ bracelet style, or creative cut-out shape and designs or multi-stoned bling-bling style. 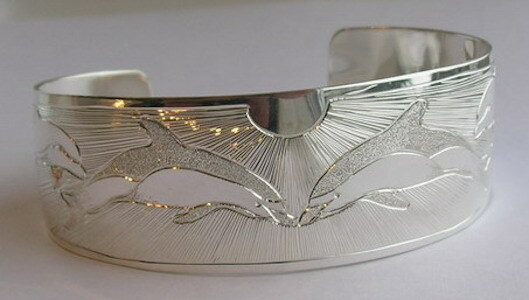 Animal and Nature motifs our specialty. Any width or length is possible. Some designs require a larger space or loose quality of detail and artistic evidence. 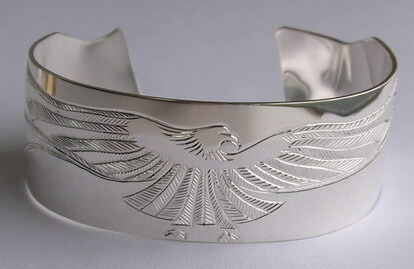 Some Non-Native designs seem to be the most challenging. Have a look at my Dragon and the 2″ Piano Bracelet. I began the piano bracelet to try and have a 2 dimensional medium look like a 3 dimensional object. Appliquéd ( metal on metal ) , engraved and added precious and semi-precious gem stones add substance and complexity. 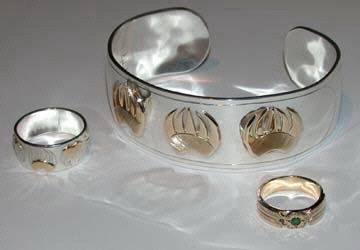 These are mostly cuff bracelets. 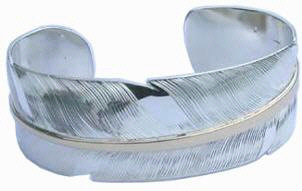 A style common to Kwakuilt custom, but other styles and shapes are possible. 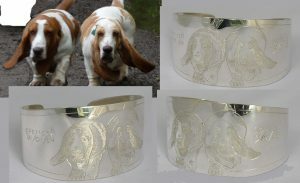 There are so many theme variations and designs possible, but I have to admit I haven’t strayed from the cuff style too far since it is very conducive to engraved design where many slim or wire based bracelets just aren’t. I have no problems with different suggestions and styles and would welcome a fresh approach and idea from you. I was chatting with my son and he thinks we should go with something like Mnb3 with the mountains and gold tips and just place the 5 birthstones above the peaks? Could you come up with an idea for me. I like a width of 5/8 or 3/4 ……flexible on this. Her wrist size at the bones is 6 1/4 inches. I was hoping to get it back to Kelowna by Thursday September 20th. My daughter lives in New Westminster and is coming up to Kelowna on the 21st so I could also get her to pick it up on the way. Looking forward to your response and costing.